You can print on any compatible, ink jet-printable CDs or DVDs (including Blu-ray Discs), preferably with a white surface. Note: If you are using discs where the printable area extends to within 0.16 inch (4 mm) of the center hole, you may need to adjust the inner diameter setting using the EPSON Print CD software. Make sure you burn your files, music, or video onto your disc before printing on it. 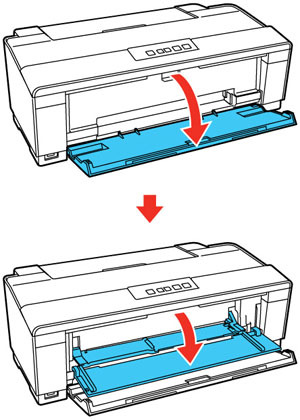 Remove any paper loaded in the sheet feeder, and close the paper support if it's open. Open the output tray, but do not pull out the extensions. Then open the CD/DVD feed tray. Place your disc on the included CD/DVD tray with the label side up. Note: For small 8-cm discs, place the adapter on the tray and then place the disc in the adapter. 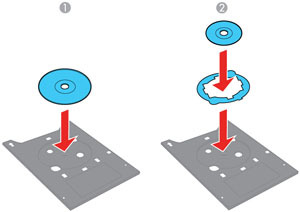 Before placing the CD/DVD, make sure no foreign particles or substances are on the CD/DVD tray. Otherwise, the CD/DVD and the data on it may be damaged. 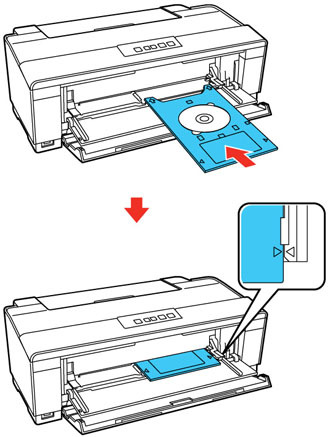 Gently insert the CD/DVD tray into the CD/DVD feed tray. Push in the tray until the arrows on the tray and feed tray are aligned. Do not insert the CD/DVD tray while the power light is flashing. Otherwise, the product or your CD/DVD may be damaged. Do not turn off the product with the CD/DVD tray inserted in it. Always remove the tray first.